It’s convenient to snap pictures of your furry friends with your camera or smartphone when a cute or playful moment presents itself, but those aren’t the photos that you’re going to want to print and frame. For display, you’ll want professional pet photos that are done with taste and grace. We all melt when looking at photos of puppies. It's the sweetest thing ever and we all wish we could have a puppy again. You may have had a puppy once, but you barely remember it because the puppy grows so fast! Who doesn't like to search for puppy photos? The beautiful pictures of little and clumsy animals, sleeping or playing, with great light, keeping all the details and the softness. High end photography is hard to achieve with iPhones and those types of photos don't do justice to your dog at all. Those playful, cuddly puppies will grow up fast. You’ll want to capture this moment so that you will be able to remember it when your friend becomes an adult and eventually a senior. This is the sweetest and most innocent phase of your pet’s life, and before you realize it, it will be gone. So the sooner you immortalize it in photography, the better. Boxer puppy with her mom during his puppy session with Frame Your Pet Photography. I wish they did, but they will die some day and then what will you have? 1000 photos in your Dropbox all with bad lighting and resolution enough for an 8x10. Many of my clients are booking what I call Rainbow Sessions. It’s for pets who are nearing the end of life either due to old age or an illness. It’s great to get those photo opportunities in before it’s too late, but why not get a new photo shoot done with them every couple of years, when they’re still strong and healthy, so that when they do pass, you’ll have something to illustrate their whole life. We all take professional pictures with our spouses or families. Why not honor your beloved pet with a quality photo shoot as well? Pet photography also has the ability to be more artistic in lighting and backdrops than family portraits. Imagine the action shots, the cute poses and expressions framed perfectly on your wall. Family portraits, when displayed, tend to be no larger than 8x10, but an artistic pet photo can look great at larger proportions. Cooper's family gave themselves a gift with beautiful family portraits in their home. This isn’t stock photos or store-bought décor. This is unique and personalized art. 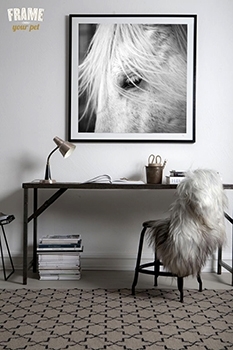 Photos of animals make great pieces of art. But instead of spending thousands of dollars on a photo of a horse or dog you don't know, now you have the chance to have your own custom made piece of art of your cat or dog. As an artist and photographer, I understand your needs for such art and that's why I created my Fine Art Sessions, which are meant to serve as large gallery mounted prints worthy of display. My photos are elegant, striking images that you will feel proud to have in your home. Visit my Wall Art gallery to see more examples on how I can turn your cat, dog or horse photos into a masterpiece. You might take some great photos, but they still won’t have the professional touch to them. A career pet photographer has the training, the equipment, the experience, materials, and supplies to produce a gallery-quality portrait. The professional pet photographer will not only provide you with images that you never thought possible, but will shoot thinking about colors and composition. Also, the professional lenses are able to capture the light and details that no point and shoot camera or iPhone can. Plus, a skilled pet photographer will take care of fine tuning the image: removing eye bugs, removing the leash from the photo, removing people in the background, enhancing the fur details, the colors, etc. To create a more piece of art more than just a quick shoot of the moment, the photo needs that fine tuning that only a professional pet photographer can provide. This photo was taken with an iPhone. Akame's mom bought a Fine Art Session with Frame Your Pet and this is one of the photos of their session. They actually decided to print and mount this one on 24x36 aluminum piece. Pet photography is a bit of a luxury, but once you capture those moments with your friend, you’ll have them forever and will have no doubt of their worth. We all return to photos from time to time when we feel nostalgic: photos of when we were kids, when we had that trip to the Grand Canyon with all the family, the Christmas evening when Grandpa was still with us, our wedding day. Photos immortalize that moment in time, that split second that will no longer be with us. Only the photo is the proof that that day existed and we lived it. So memories are not only priceless; they tell the story of our life. And cats and dogs are our life too. They grow up with us, they share every day with us and our kids, so it's very important to have their presence in our lives documented. This is especially true when you don't have children, as many do not. Pets are very much our family, and family in any form is a treasure. Shino turned 17 years old and his family decided to celebrate it with a professional pet photography session to capture his personality before it was too late. The quality of your marketing speaks volumes about the quality of your products or services. Look at any company and you’ll see that their sales increase in direct correlation to their marketing budget. The more you advertise, and the better your advertising is, the more customers will notice you and entrust you with their business. If you want your business to grow and see an increase in customers or client, taking your advertising and display materials to the next level with customized, professional pet photography is going to be key. A Spanish Horse Breeder and Horse Club commissioned Frame Your Pet a series of Fine Art equine photography to illustrate their high-end service. The photos are being use for their website and marketing activities such as brochures, printed ad's, posters etc. Of course, you’ll still want to take your own photos when the right moment strikes, but for the purpose of creating art and important keepsakes, only a professional pet photographer can deliver the quality you desire. Take the time to schedule your photo shoot today! Related articles: Tips to choose the right pet photographer, How good dog and equine photography can help boost your business. Share this article if you found it interesting.